Not far from Caras Celairnen are what is known locally as the Oracle caves. They are known as this as those who visit them claim to hear voices and prophecies. In reality, the caves are a trap for a mix of marsh gases and sub-volcanic gases venting through fissures in the cave. Anyone entering the cave must make an RR against Poison lvl 10 or succumb to hallucinations. If removed from the area then the affected person will recover in about 24 hours. If they remain within the cave for more than 6 hours then they will eventually succumb to hypoxia and die of asphyxiation. The caves are also a way into the underdeeps that exist below the whole area of Celairnen. These are part of the ancient workings of the Dwarves in the first age before the sinking of Berelaind. An entrance might be discovered with a -50 perception. A party attempting to delve into the underdeeps this way will be driven back by the fumes, although there could be some inventive ways of getting past this. Sitting on a small floating island of marsh vegetation within what appears to be a natural arbour of plants sits a small stone statue of a frog. To look at it, it would seem unremarkable, although skilfully created, however when the party approach the frog will speak. Hail travellers! Stop and hear my sorry tale, for I am the most unfortunate of men. Once upon a time…. The Frog will then go on to tell the party the background behind his story and at the end will entreat them to recover the wedding gifts he had collected for his bride. If these can be recovered then he believes that the enchantment will be broken and he will be restored to his true love. The gifts are an iron rose and a basket of amber. All three are somewhere in the swamp but he knows not where. The Iron rose can be found under the lonely tree on the floating island. The amber is guarded by the Labyrinth of Thorns and the basket is can be found in the nixie pool. However, the adventurers should beware as the evil elf who cast the enchantment set guardians to prevent the items being reunited. Some distance away you notice a small hill rising from a misty area of the swamp. As you draw closer an acrid stench assaults your nose and begins to strip the back of your throat. Soon you are walking through foul vapours that seem to rise from the hill. On the hill, you notice several crude basket like cages. On closer examination, some contain the remains of humanoid-like creatures, some look to be infants. On a raft of woven marsh grasses is a small village of the swamp people, some 15 houses made of reeds. This is the home of the swamp people who for some reason only known to themselves believe that they are inheritors of the swamp. They all have some form of webbed fingers/feet and usually some other disfigurement. This is because in addition to the inbreeding they leave their young on the noxious mount resulting in further mutations in future generations. The swamp people are not overly aggressive unless the adventurers set foot on their village raft or they have desecrated the noxious mount, in which case an attack on the outsiders will begin. There are around 30 adults and 15 youths all capable of wielding a club or firing a short bow. The sheer number should provide the party with enough impetus to run, for even though they might take a few down the overwhelming number will soon result in defeat. This is a strange drifting construct built upon the magic of decay and death within the marsh. Held together with the will of a Mewlip the raft drifts through the marsh at a rate of 1 hex every 4 hours. The island is populated with PCs x 1 D6 of undead creatures. The undead creatures are drawn for the local animal population that has expired near the Mewlip. Treat the undead creatures as normal but immune to stun and bleeding but taking double damage from fire. The Mewlip will direct his “forces” until they are all defeated then it will flee down the tree into its underground lair. Drifting towards you is a small raft of vegetation upon which stands a rough shelter built around a decaying tree. You are soon aware of an overriding stench of death and decay. On the island standing atop of the dead tree is a spectral figure wielding a scythe, around the tree numerous creatures from the swamp in various states of decay. The walls, floor and ceiling of the dungeon are a mix of mosses, roots and bodies. Hands will reach out and grab or slow down anyone but the zombie master passing through here. Movement rates are quartered. If destroyed by a turning attempt, the passage widens by five feet, and again it will not impede the progress of the adventurers. 1. Entry Chamber. A chimney leads up to the surface, up through the middle of the main support pillar of the Mewlip’s lair. This chamber contains a trio of undead boar. 2. Oubliette. This side passage ends at a pit trap (-20 Per). If the passage has been burnt/rendered inert, then it triggers on a 1-4 in 6. If the passage has been destroyed by a turning attempt then the pit trap is no longer covered. Otherwise, it automatically opens when the first person steps on it and immediately snaps shut again. The pit is 10 feet deep and is lined with bony spikes that are partially submerged in a couple of feet of fetid water (+80 Missile). PC may attempt to leap to one end or the other with a Very Hard MM. 3. Bony Trap (-10 per, -10 disarm). Massive bone spikes thrust up from the floor when the pressure plate here is sprung (2 in 6 chance for each character walking past the trigger). This is a mechanical trap, not powered by the undead. +93 missile attack with a very hard saving MM. 4. The Iron Rose. If the Mewlip sticks to his plans, he will make his final stand here, in front of the massive iron rose. The iron rose is a10-foott tall reproduction of a living rose, thorns and all. It weighs 300 pounds and is incredibly awkward and bulky. In tight confines (like the halls here if they haven’t been destroyed by clerical turning) this gets even worse, almost immobilizing those who try to drag it out. Once the zombie master has been killed, there is a frenzy of activity in the swamp waters just off the island. A pair of giant catfish has gone berserk without their creator and will attack anyone leaving the island. Over the next month the island will slowly disintegrate into the swamp. If the rose was the last of the items needed for the Frog God, the watcher in the water will notice the party and will attempt to interfere with their return. Deep within the woods on the Northern edge of the swamp is the Labyrinth of Thorns. The wood itself is not without it’s dangers as evil trees and huorns still live here. The thorns are dense enough that they prevent visibility and mobility through them, and the constant dampness of the Mire combined with the strangely persistent rains here keep them from being burned. They could be hacked through (each 5 foot by 5 foot section of thorns has 50 hit points), but doing so will take ages. It will be far easier to follow the labyrinth to find the centre. The labyrinth is patrolled by a total of a dozen skeletons carrying six javelins each. Each turn a group of d2 skeleton will be encountered on a roll of 1-2 on a d6. In the centre of the labyrinth is a 12 foot tall, black and green, dodecahedral stone. At the top of this stone is a depression full of rain water and contains four massive chunks of amber, each roughly the size of a human head. In order to transport this item, the PCs will need the basket from the Nixie pool. If anyone disturbs the amber, the remaining skeletons will attack. Also, anyone touching the amber while it is still in the pool on top of stone will be subject to a curse of perpetual damp (lvl 10). Until the curse is removed, it will always rain where the subject is (although not indoors and not ridiculously localized). If this is the last of the items needed for the Frog Prince statue, the watcher in the water will notice the party’s activities finally and will attempt to interfere with their return. This is a crafty dead end for your players to discover the watcher in the water and realise that faced with impossible odds the only wise course of action is to run. 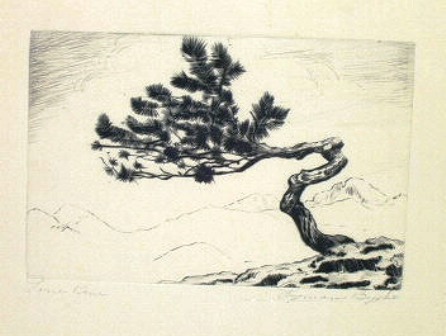 Across a noisome pool stands a lonely pine (looking a lot like the lone tree on an island described by the frog prince statue). You could skirt the edge of the pool on a hard MM to not touch the water. Any adventurer disturbing the water will awake the watcher in the water’s interest. Quickly the party will be beset by tentacles which if they are wise will drive them back. Although a freak kill should be allowed, the aim of this encounter is to build tension not to destroy the party. Of course there is nothing at the pine tree. The causeway path ends at a noisome, green pool of water. On the far side there stands a single pine tree on a small hill. Looking carefully, you can see that it would be possible to tussock hop round the edge of the pool without getting more than your feet wet. A blurp of marsh gas surfaces in the middle of the pool. The path seems to end a thicket of bushes. Beyond you think you can hear the clear laughter of young women. Pushing through the bushes you reach the edge of a clear pool of water. In the middle floats a small basket like coracle. Sat around the edge of the pool and, swimming in the water are a group of beautiful women. Their presence is utterly enchanting and you cannot believe that these defenceless damsels are here in the swamp. The water Nixie who live in this pool are Maia associated with the Lhun and the Uialduin. They are not inherently aggressive to the trespassers but it is worth remembering that these are still powerful elder spirits with a capricious nature. There are three ways the adventurers might choose to get the basket (which is needed to transport the amber and iron rose). They could ask for it, steal it, or take it by force. As a GM it is worth reminding the players of the nature of the spirits they are dealing with in case they have forgotten or are unaware of who they are meeting. A request for the basket will partly depend on how the adventurers spin the story. If there is a bard in the party who could tell the story in style the cost will be a lot less than just a perfunctory explanation. However, it is done the Nixie will be suckers for the a love story and will agree to part with the boat which holds their shiny things for a boon. It is up to you what the boon is, but it could be an item offered to the pool by each adventurer (useful for divesting players of over powerful items) or it could be that they require a service now or in the future. Stealing the boat is extremely difficult. This will not be a normal petty theft. Water is the Nixie’s natural element so they will know who enters the pool and they are powerful enough to see through any illusions thrown by the adventurers. So although the players might decide on this course of action the result will be discovery.